In my post for Birding Is Fun! last month I may possibly have mentioned how much I am looking forward to attending The Biggest Week in American Birding this year. I can't wait to see the birds! I posted photos of some of the beautiful warblers that decorate the trees of Magee Marsh here. 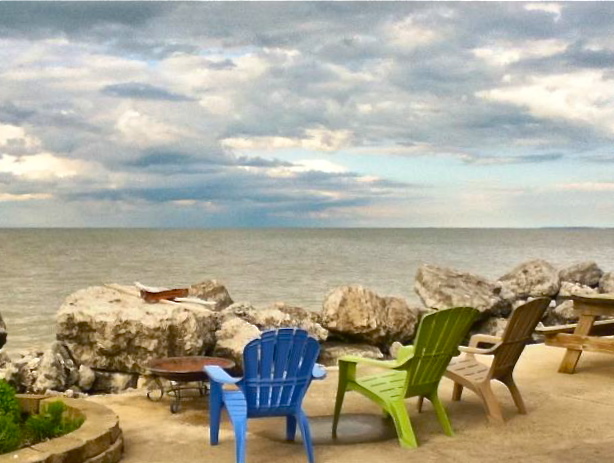 One reason that I am anxious to go back is that I will be returning to the cottage that I rent on the shore of Lake Erie. I love seeing my birding friends at The Biggest Week. 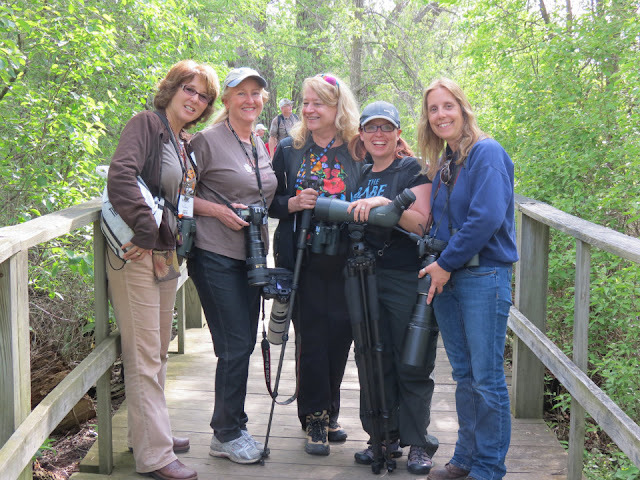 Debbie Miller's husband took this photo of birding girlfriends last year. Dawn Fine, Kelly Riccetti, Linda Rockwell, Sharon Stiteler and Debbie Miller on the boardwalk at Magee Marsh. Sharon Stiteler, The Birdchick, hosts a Birds and Beers event during the festival. Everyone had a wonderful time! Sharon Stiteler helped me take this digiscoped photo of an Eastern Screech Owl with my iPhone. A highlight of the week was watching this pair of Great Horned Owlets in a hollow tree. The tree was visible from the boardwalk, but it was almost beyond the range of my lens. Here is another view of the adorable owlets. Both birds fledged during the week that I was there. I enjoyed watching the barn swallows that nest at the Visitor's Center at Ottawa National Wildlife Refuge. There were so many barn swallows that territorial disputes were common. There is ample opportunity to watch courtship behavior. This male Rose-breasted Grosbeak was doing his best to attract the females in the nearby trees. This is one of the lovely ladies whom he was hoping to attract. I followed a flash of red, and I was finally able to get a good look at a beautiful Scarlet Tanager. One of the more interesting things that I saw was a large and lovely Cecropia Moth (Hyalophora cecropia). I am very much looking forward to seeing Lake Erie sunrises. I hope that I will see another Lake Erie rainbow. Most of all I am looking forward to seeing the beautiful Ohio birds and wonderful Ohio birders at The Biggest Week in American Birding. You should go too. So cool...I hope I don't have to wait until I'm retired to have a week off in May. I guess I need to get fired...for the good of the birding. Absolutely! You must go to The Biggest Week and the Rio Grande Valley Birding Festival. You just can't miss them! Great photos!!! That patio looks like a superb hangout. See you there soon! It's a lovely place to sit and perhaps sip a beverage or two. Can't wait to see you! Great photographs, Linda! It looks like Biggest Week is a lot of fun! I'm happy that you like the photos. It is a wonderful festival! You should definitely plan to attend! Wonderful photos Linda - looks like it was a grand time. Nothing better than spending time with friends! Thanks for the kind comments about my photos Dan. I do look forward to this festival very much every year. When can we expect to see you and your wife there? Oh my! This does look fun! I think I know that Fine lady;) Love these kinds of trips! I can feel your enthusiasm for the event while reading this wonderful post. Looks like a fantastic time. Terrific photographs of beautiful birds and lovely scenes viewed at The Biggest Week! That you Julie, and thanks for your kind comments about my photos. The only thing that would make it better would be to have you there! I am so envious! I had set as my goal to go to The Biggest Week this year, but can't make it. Also one obstacle is that there is no easy connection from VT: driving? flying? None of them are good options. Travel can be a real headache, that's for sure! I'd love to meet you at The Biggest Week or at another festival someday!